It really is no wonder that the Americans ( and to be fair, Canadians are not far behind) have so much credit card debt! I saw this odd commercial the other day ( I cannot locate the video online) relating the the new advertising campaign by Chase Bank's new "Text Account Balance" feature for their customers. While the technology and convenience seem interesting, the commercial was quite telling. In the ad, a woman was at the mall with her two children and all of them were "loaded" with shopping bags. Taking a break from their exhausting day, the mother wonders aloud if she should make that one last purchase? 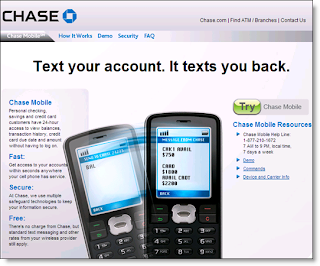 Not knowing if she has enough money/credit left in her accounts, she pulls out her handy cellphone and uses the Chase Text service. Whew...thankfully she has just enough for those pair of shoes! Now seriously, if you really have to wonder how much money you have LEFT in your bank account/line of credit or credit card, should you really be out on a spending spree? Hmmm... Its no wonder that people end up in serious financial trouble. It is also no surprise that the banking industry loves it when you take out that second or third credit card....this way, you never have to want for any consumer item! And at 11 to 28% interest, they hope you keep on spending! Trust me...I could use a new flatscreen TV for the bathroom, and it would be sooooo easy to "charge" it....but in my world, cash is king. Kudos to you - I struggle with this one. In fact once I pay off my latest balance, I'll cut up the bloody credit card. As to the people who were taking out the third mortgage to buy a boat, I'm sure at some point they figured in for a penny, in for a pound.... or if you're going to lose it all, may as well enjoy the boat now. Which is dumb, but psychologically valid.